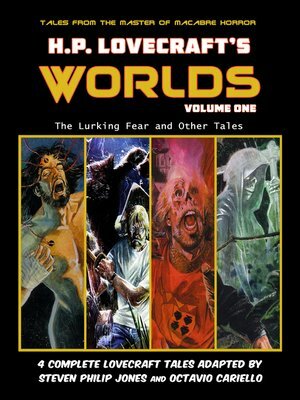 A chilling collection of four Lovecraft tales adapted by award winning comic writer Steven Philip Jones. Lovecraft is considered one of America's most innovative and popular American horror writers and his distinctive style and canon of work has influenced many authors. Jones takes the classic tales and while remaining true to the source, brings them into the modern age which can sometimes make the horror even more terrifying. These tales are illustrated by Octavio Cariello who has worked on DC's Green Lantern, Deathstroke, and Black Lightning comic series. The four illustrated stories within this Volume are "The Lurking Fear" where Arthur Monroe explores a sinkhole where bodies are found, savagely torn apart is if by wild animals. "Beyond the Wall of Sleep" shows that the power of the mind is a mysterious thing and when a researcher finds that he and a criminal patient are somehow linked, the effect can go beyond just mysterious. "The Tomb" tells the tale of Jervas Dudley, who is convinced ghosts exist and when he visits the site where his ancestors perished 200 years ago, he might just find out for sure, and "The Alchemist", for over 600 years the male descendants of the Chabrillane family have all inexplicably perished on their 32nd birthday. Now, the last Count de Chabrillane is about to turn 32.